Rewiring our brains for more peace, happiness, and satisfaction. Sounds like the stuff of a great science fiction novel. The truth is this is all very doable and we can learn to enhance our life experience by learning the tools that help us go beyond our primitive programming. 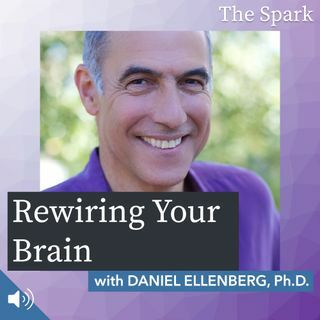 Daniel Ellenberg, Ph.D. is the president of Relationships That Work – an organization that supports people to create more emotionally intelligent personal relationships – and vice president of the Rewire Leadership ... See More Institute, an organization that helps individuals, teams and organizations thrive in the business world. He is also the founder and director of Strength with Heart men’s groups and workshops, and co-author of Lovers for Life: Creating Lasting Passion, Trust and True Partnership, which he co-wrote with his wife, Judith Bell. Join us as we talk with Daniel about growing up in New Jersey, learning how to have difficult conversations, dealing with internal anger, toxic masculinity, and more in this special extended episode!